In today’s era, organizations are increasingly adopting multiple cloud services, including public, private, and hybrid clouds, to meet increased agility, innovation and cost management goals. 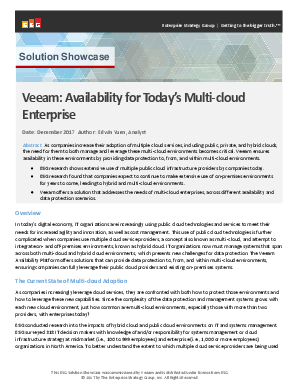 Veeam ensures availability in these environments by providing data protection to, from, and within multi-cloud environments. ESG led a research among IT decision makers to better understand the extent to which multiple cloud service providers are being used today and how that influences the use of on-premises and hybrid cloud environments in the future.